California Native American Tribes and tribal communities have sovereign authority over their members and territory and a unique relationship with California's resources. All California Tribes and tribal communities, whether federally recognized or not, have distinct cultural, spiritual, environmental, economic and public health interests and unique traditional cultural knowledge about California resources. 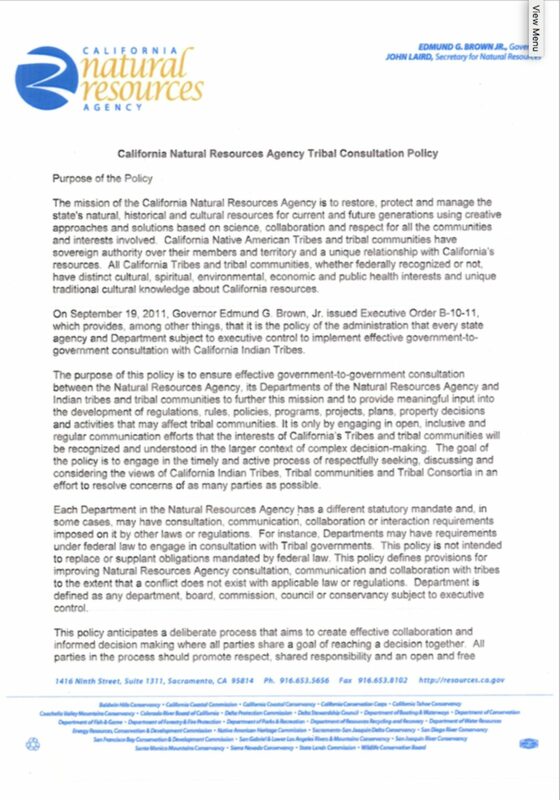 On September 19, 2011, Governor Edmund G. Brown, Jr. issued Executive Order B-10-11, which provides, among other things, that it is the policy of the administration that every state agency and Department subject to executive control to implement effective government-to-government consultation with California Indian Tribes.